Visit Our Showroom in Franklin Square! At Modiani Kitchens and Interiors, we aspire to create the most beautiful and functional kitchens for our clients. We believe in the symbiotic relationship between form and function, art and design. As such, we take a holistic approach to inventing inspired spaces that are meant to be used as well as admired. We are a high-end, full-service interior design firm that offers a stylish and easy approach creating beautiful spaces. Tami Wassong has over 25 years of experience in Residential and Commercial Design. After working with high-end residential designers and commercial designers she left to start her own firm in 1998 Tami Wassong Interiors. She holds a Bachelors degree in Interior Design from Syracuse University and is an NDIDQ certified/licensed Interior Designer. 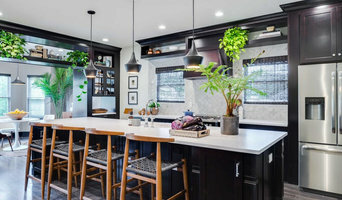 Her firm currently provides interior design services in NYC, Westchester County, Connecticut, Massachusetts and Florida. Each project is approached in a highly personal way working one on one with every client. Each interior reflects the true personality of each individual client. Design ideas are created and presented using drawings, photos, visits to showrooms or workrooms and samples. Tami's strong design and architectural background have made her interiors be known for their form, shape, and material and how they relate together, these are the "essence of good design". She is not drawn to any particular period or style. It is with this openness that a truly beautiful interior can be obtained and enjoyed. Direct Importers of high quality Italian ceramic tile and porcelain tile, as well as tile from all European and worldwide tile and stone sources. Distributors and dealers of handcrafted tile such as Sonoma Tilemakers, Quemere Tile. Glasstile by Oceanside, Mandala, Alysedwards, AKDO, Original Style, Glazzio, Soho Studios and so much more. From remodeling a cozy kitchen to gut renovating a Brownstone, our creative team can handle it all. We have over 25 years of experience remodeling homes across five boroughs. With our team at your side, you can count on us through every step of the renovation until we’ve created the dream home you’ve always wanted. At Atmosphere Kitchen & Bath, all of your Kitchen, Bath, Design and Build needs can be met at one location. Come visit our new 4,000 sq. foot, state of the art showroom. As an award winning, full service, kitchen and bath design studio for more than 30 years, we feature over 70 different vendors, carrying the latest in cabinetry, tile, stone, countertops, and plumbing. Our talented design team provides a true “one stop shop” experience for our clients, allowing you to work side by side with one designer throughout each stage of the design process. Our wide range of products fall within various price points, allowing us to get creative while staying within your budget. Our 3,000-square-foot Westport showroom is being renovated this holiday season! We’ll be expanding our footprint into an adjacent building, allowing us to create a new kitchen display room, as well as a beautiful bathroom annex. We’re expecting renovations to be completed by early 2018 and can’t wait to share it with you! Stonington Cabinetry & Designs is a company that designs, orders and installs custom cabinetry with a specialization in high-end kitchens. It was formed by four family members: parents Karen and Robert Sachs, and their sons, Justin and Tyler, who are the principal operators of the business. For over 30 years, Karen and Robert have run a separate successful construction company focusing on exclusive remodeling projects. Justin began working with his father at the age of 19, and progressed swiftly into finish carpentry, eventually designing, building and installing his own cabinetry. Tyler joined soon after working side-by-side with his father and brother on remodeling projects throughout northern New Jersey. 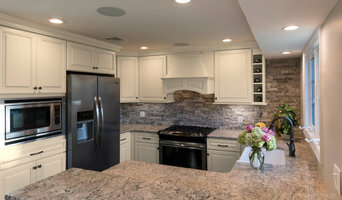 The brothers’ shared goal became to open a design studio offering a quality line of custom cabinetry and supporting it with design and installation services that are unsurpassed in attention to detail and craftsmanship. 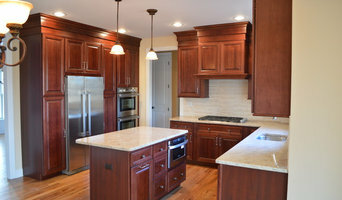 The result is Stonington Cabinetry & Designs – a company whose commitment to excellence in all aspects of designing, ordering and installing custom cabinetry is a direct reflection of the influence of their parents, and a driving force in their quest to always achieve 100% customer satisfaction. *Authorized StarMark & UltraCraft Cabinetry Dealer* In 1977, an idea was conceived: A unique retail concept giving the general public the ability to create the kitchen and bath of their dreams by employing a fundamentally sound structure from the bottom up. With the highest quality cabinets available in the industry, along with revolutionary computerized design services and quality customer support, these dreams have been realized by hundreds of thousands of people. Because we were dedicated to servicing the American consumer, the name “Consumers Kitchens & Baths” was adopted. Consumers has evolved into the nation’s fastest growing specialty retailer serving the metropolitan New York market, employing many of your Long Island neighbors and maintaining modern facilities exceeding a quarter of a million square feet. Our commitment to remain America’s largest independent supplier, fulfilling Long Island’s home improvement has been the key to our long term success. Combined with millions of dollars in “state-of-the-art” computerized technology, innovative designer showrooms, and the optimum in warehousing and delivery equipment, those ideals will continue to be foremost in our continued growth and success. *Authorized Waypoint Living Spaces Dealer* KABINET KING USA, an authorized Waypoint Living Spaces Dealer, is focused on providing high-quality All-wood cabinetry by multiple Brands. Our exclusive line of Semi-Custom and Custom Cabinetry includes American Made Cabinets from lines such as Waypoint Living Spaces by American Woodmark, Medallion Cabinetry, StarMark and StarMark Inset Cabinetry, Diamond Cabinetry, Dynasty by Omega kitchen cabinetry, Laurier Max Custom Cabinetry and more. 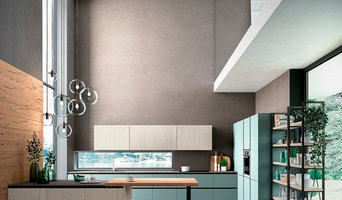 In addition KABINET KING USA is a leading provider of IN-STOCK Cabinetry with over 75 styles of In-stock Kitchen cabinets available that can be delivered in 7-14 days throughout the USA. We also service contractors & homeowners in need of 3D designs, and plans for complete interior remodeling projects. We have a state-of-the-art design center, large flatscreens, and the latest design software that allows for detailed & precise planning for any space. Our all wood kitchen cabinets are priced for affordability. Our cabinets are competitively priced and come in less than big box retailers, and many of our competitors. And with our Lower Price Gurantee, if you find a lower price for the same product within 30 days from a valid retailer with a brick and mortar location we will match it. Top Design Experts in Kitchen & Bath. Best of Houzz - 2018, 2017, 2016, 2014 Introducing a different kind of kitchen company…where the idea of value applies to everything we do. Nukitchens is a complete kitchen renovation company, offering everything from concept & design to installation & remodeling. 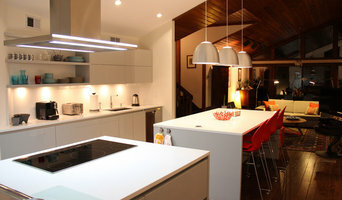 We are kitchen specialists with decades of experience and know-how. Our business philosophy is simple…to help you make the best decisions with your best interest at heart. Just ask anyone who has worked with us before.